You are coming to Greece to celebrate the wedding of Nicole and John. auspicious sites that Greece has to offer? would include on a trip in Greece for beloved family members. We also live here. Be sure that you will see, hear, taste and experience a lot without being rushed or hurried. We have put the love and care of our 20 years experience into two tours. ​Private-only for the wedding guests of Nicole and John. ​Join us for two immersion tours! Our excursion this morning starts at the New Acropolis Museum, rated one of the best museums in the world (and we love it because it is small and to the point ;), where our guide will give us the full meaning of the treasures we will see. Then we will break for lunch at any of the many excellent sidewalk bistros nearby, your choice. Our tour continues with the auspicious slopes of the Acropolis where we will visit the Theatre of Dionysus, where experts believe that theatre began. 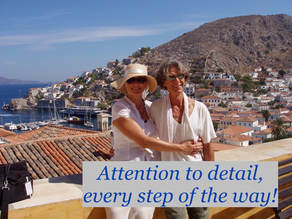 With our local expert guide we will climb up and see the Temple to Athena Nike and the Parthenon. 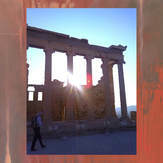 Learn about what the ancient Greeks mean to us still today. We will then make our way to the Agora, the center of ancient Greek life where Socrates and Plato debated and where the life of ancient Athens reigned. We will be following in their footsteps as our guide takes us around. Be ready in the evening as we take you to a special place for an authentic Greek multi course meal with wine. It is in neighborhood known to us locals (Manolis & Patricia) and near our house in the suburbs. We'll provide private transfer to get you there and back. We are up for our walking tour of Athens. We will see Parliament and the changing of the guard and constitution square (Syntagma Square) on our way to visit the original Olympic Stadium of the modern games. You can mount the award stand and run the oval as an Olympian. We will break for lunch on your own. await us and we will see everyday Athenians purchasing their daily food. We will buy some goodies from the market to taste as we walk around. Afterwards we will taste test real Greek coffee made the way it should be (in heated sand). Greek breads and pastries will be ours to try at several stops with the famous baklava and bougatsa on order. Onwards we roll, as we stop at a famous delicatessen to try Greek charcuterie. We will pop into spice shops and also show you what you need to take home with you for presents and for yourself. ​We will end with a sharp taste of Greek Raki (grappa) and so much more! 3 hours. 2. Cape Sounio Tour-We will leave Athens by private coach for Cape Sounio UNESCO World Heritage List and the Temple of Poseidon. Our drive will take us along the beautiful winding coast, known and the Athens Riviera. The earliest reference of cape Sounio was in Homer's Odyssey. The site which incorporates the temple to Poseidon is surrounded on three sides by the sea. Ancient Greeks coming back from ship voyages, knew they were home, when they spotted the Doric columns of this spectacular monument. We will have a guided tour plus plenty of time to absorb on our own. 4 hours. I Would Like A Spot! We leave Athens early for our trip to the Peloponnese (the Island of Pelops) and some of the richest lands and sites that Greece has to offer. We head inland to the heart of this large 'island' and the famous ancient theatre at Epidaurus UNESCO World Heritage Site with its amazing acoustics (you can drop a coin in the center and hear it in the farthest seats). It is here where many of the greatest singers of all time have performed, including Maria Callas. Still today, there are ancient Greek plays performed during the summer festival. After taking our time absorbing the museum and ruins, we will have lunch together sampling local Greek specialties. Afterwards are off to the quaint hamlet of Nafplio, one of Greeces' best preserved neo-classical towns with stunning seaside views. As we approach the town we will drive up (alternatively some people might want to climb the 990 steps :) to the fortress of AcroNafplia for breathtaking views of the Argolic Gulf. 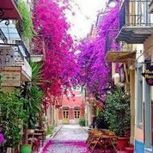 After we check in you can take your time exploring the town on your own, with its small cobblestone streets and colorful bougainvillea vines. Enjoy dinner at any number of places, seaside or at a more traditional tavernas- famous for their seafood and traditional home cooking. Save some time for shopping as Nafplio has some exquisite small boutiques with with handmade jewelry and crafts. After a leisurely breakfast we are off to the imposing ruins at Mycenae and Tiryns (UNESCO World Heritage Sites). Our first stop is Tiryns where we can get our first look at 'cyclopean walls', and after we will head off across the Argolid Plain to the citadel of Mycenae where the mythical Kingdom of Agamemnon (and Clytemnestra, Iphigenia, Electra, Orestes) and its palatial center once stood. After taking our time there, we are off to Nemea, where Hercules was put to one of his labors (slaying the Nemean Lion). It is here where we will have a look at the ruins and one of the best intact ancient athletic stadiums in Greece, before stopping by an award winning winery (the St. George grape) for lunch and wine tasting*. After our leisurely lunch we will head back to Nafplio where you can have some time on your own to explore and shop. Nafplio also is known for it gelato, so be sure to sample to your hearts delight. Later you can sit in the main piazza of Nafplio sipping a cocktail as you watch the locals go by, experiencing a slice of Greek life. Enjoy your breakfast this morning or take a walk along the seashore. Either way we will leave mid-morning for our trip back to the mainland. We will first stop at the auspicious fortress of Acrocorinth in the area where St. Paul wrote his letter to the Corinthians. We'll talk about the surrounding area and the role it played in Ancient Greek culture. In clear weather we can enjoy fantastic views over the gulf of Corinth and the mountains of the mainland. After taking our time exploring, we will set our course for the Corinth canal a feat of engineering for its time. The afternoon finds us back in Athens at the hotel of your choice. want a room to yourself then it is available for an additional $125 above the cost of your tour. Please email us to tell us that you want a room to yourself. ​May 30th You leave for the island of Paros to get ready to celebrate the wedding! Here is a list of hotels in Athens that we have either used in the past or our trip participants have. There are a lot of chain hotels also, so if you get points you might want to try those also. This is the time to plug in any credit card points that you have accumulated. If you want to join our tours than you should leave your stateside location 1 day ahead of time. Remember you will arrive the next day in Greece from the day you depart (Greece is 7 hours ahead of EST so you 'lose' 7 hours. Going back you will arrive back the same day because you 'gain' 7 hours). So if you want to arrive and plug into our first tour on May 25th then you should arrive a day early. So that means you need to leave the U.S. on the 23rd of May to arrive in Greece on the 24th of May. It has been our experience that if you arrive one day early than any scheduled events, that it helps immensely. It is good to have one day where you have absolutely nothing to do except wander around, get some sun on your face, eat lightly and get some rest. 1. Your credit card company points concierge. They are usually very skilled on not only getting you the best connection, but helping you use your points in the best way. Why do we suggest you fly from Athens down to the island of Paros and back, when there are so many ferries to choose from. Well from our experience we know that these whitewashed Cycladic island, that Paros is a part of, can get very windy. So windy in fact, that all ferry services shut down. It happens rarely, but it does happen. Recently, to us this Fall. We got 'stuck' at a villa on Mykonos with a group of fourteen people. Ferry service was shut down for 2 days. Only flights were going. Please book flights to get from Athens to Paros and back to Athens for your transatlantic. That is our 2 cents. ​These two islands are very close to Paros. Maybe you would like to visit them after the wedding (or before)? We know these islands very well and have taken many groups to these gorgeous places. Our best recommendation is for us to put together the trip you want the way you want it, using our expertise. This is your own custom tour that you roll out. But we help you to put it all together. Where to go/ what to do/ our curated hotel list/ ferry and air connections/ rental cars/ things to do while you are there. All custom done for you. We script it out for you (phone and email consult), you book direct and save a lot. It does not matter how many days you want and what islands you want or how many people in your group. We charge $200 per person for the service (you will save much more than that on the bookings alone). This service includes an online trip itinerary/ script that everyone in the group can see in real time and comment.